Confidence building, encouraging and the perfect boost! INSPIRE’S novice and nervous performance course is for skiers who may have limited experience, who wish to start off on the right foot, for those who are nervous and struggling to improve and/or need to boost their confidence! If you are new to skiing, with very limited experience then book on this course – your progression is under the guidance of professionals and you will learn, improve and gain so much from a week with them. It’s an ideal course if you find yourself with partners or friends that are more competent than you and will give you that sense of achievement and development you may just need. (Your skiing friends can always join our All Mountain Performance course that runs along side this course). All to often skiers are pushed beyond their limits and end up losing confidence. 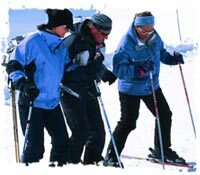 On this course we teach you at your pace not someone else’s, so fear not, relax, gain confidence and enjoy your skiing. There is a minimum level of being confident to ski nursery slopes using snowploughing. If you are a complete beginner with no experience this can be learnt on an artificial slope in the UK. 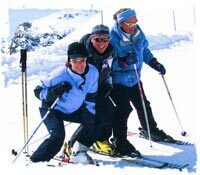 Alternatively we can arrange private or group tuition in the resort with one of the British Ski Schools. No course to date but contact us for more details if we can help !